Just in time for the weekend, Grilled Teriyaki Chicken with Teriyaki Marinade is full of mind-blowing deliciousness. 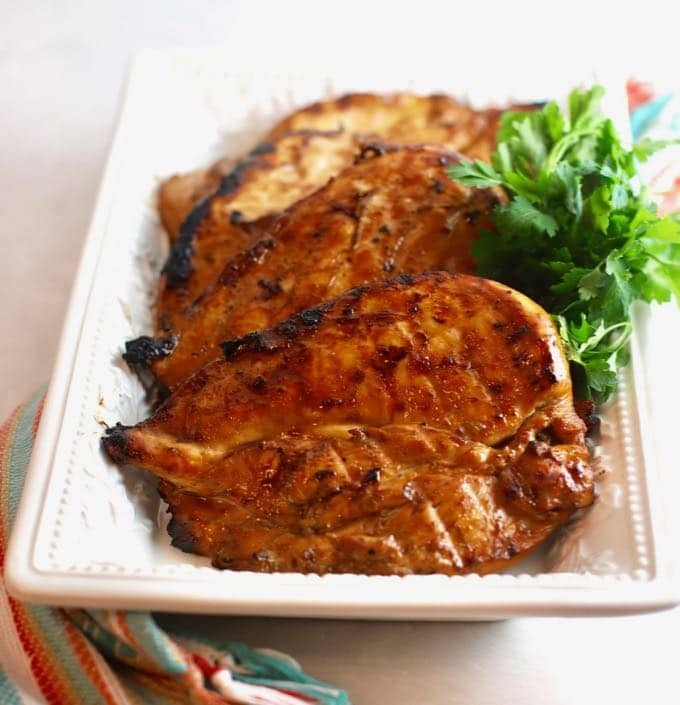 A family favorite, Grilled Teriyaki Chicken is tender, juicy chicken breasts which have been marinated in a tangy, salty/sweet teriyaki marinade until they are juicy and bursting with flavor. Spring has sprung, and the weather is perfect for grilling. It’s time to kick back and enjoy this beautiful weather while it lasts. So dust off your grill and let’s get cooking! You will make all your neighbors jealous when the fragrant whiffs of smokily grilled chicken goodness blow their way. Better yet, invite the neighbors over for an impromptu cookout with the star of the show, Grilled Teriyaki Chicken. Now I have to confess, usually, I am not usually a fan of chicken breasts. They are easy to overcook and sometimes, they are dry and tasteless. The teriyaki marinade changes all of that. But, if you want to swap out the chicken breasts for chicken thighs, well that’s fine with me. Either way, you will have a winner with this chicken dinner! Speaking of grilled chicken, it’s one of my all-time favorites. And, not surprisingly, I have quite a few grilled chicken recipes on my blog. 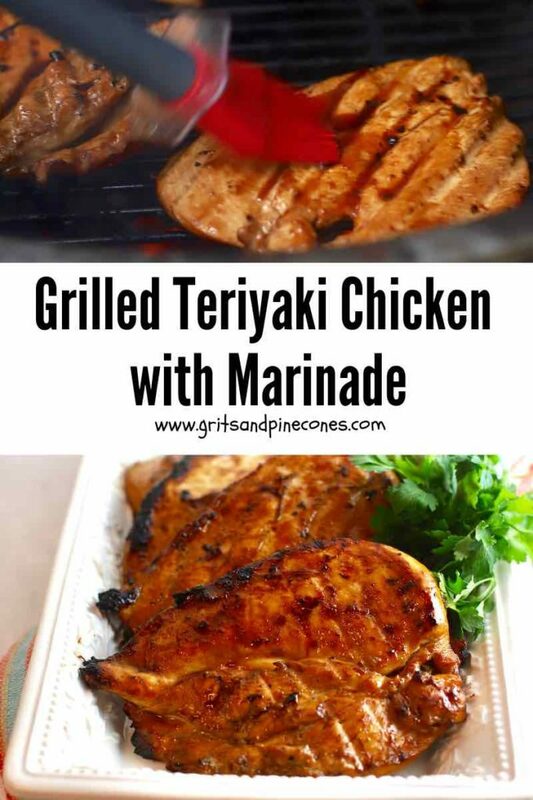 If you are like me, then I know not only will you love this Grilled Teriyaki Chicken recipe, but you will also love these recipes: Grilled Chicken with Peach Glaze, Grilled Chicken Skewers with Tomato Relish, The Best and Easiest Grilled Chicken, Simple Lemon Grilled Whole Chicken, and Grilled Beer Can Chicken. Be sure to check them out too! Add pineapple juice, soy sauce, sugar, ginger, and garlic powder to a bowl and mix well. 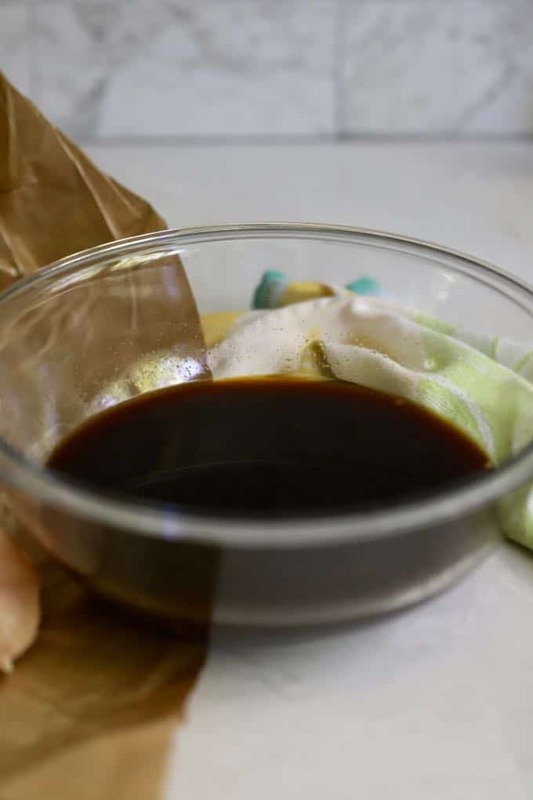 Divide the marinade in half, and cover and store one-half of the marinade in the refrigerator. 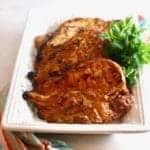 Reserve the rest of the marinade for the chicken breasts. Place the chicken breasts in a large gallon storage bag and pour one-half of the marinade over the chicken breasts. 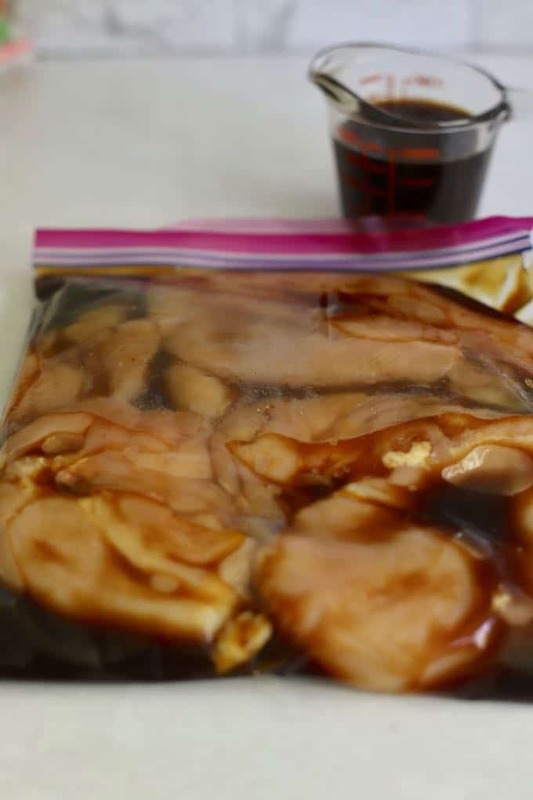 Seal the bag, refrigerate and let the chicken marinate for at least four hours or up to 24 hours. Remove the chicken from the refrigerator and let it come to room temperature while your grill heats up. Discard this marinade. Take the reserved teriyaki marinade and place in a small saucepan over medium heat. Bring to a boil, then reduce the heat to low and let it simmer for 5-7 minutes. Set aside. How to prepare the grill? Set up the grill for direct grilling and preheat to high, which is 400 degrees F.
Clean the grill grates and rub the grates with a paper towel soaked in oil to prevent your chicken from sticking. I use tongs to hold the folded paper towel. How long to cook grilled chicken? Arrange the chicken on the grill grates. While the chicken cooks, baste liberally on both sides with the marinade. Grill the chicken for 5-6 minutes per side or until a meat thermometer registers 160 degrees F. when inserted in the thickest part of the chicken. Remove the chicken from the grill and cover loosely with foil or a pot lid. Allow it to rest for about 5 minutes and to come up to 165 degrees F., which is the safe temperature for chicken. Serve immediately and enjoy. I always make more Grilled Teriyaki Chicken than we need and freeze the leftover chicken. Then I use the leftovers to make Grilled Chicken Ceasar Salad or Grilled Teriyaki Chicken Cobb Salad. It’s a MOGO of sorts, make one meal and get two or three. A win in my book! My chicken breasts were about 1/2-inch thick. If yours are thicker or thinner, it will take more or less time on the grill. Do not overcook the chicken or it will be dry. 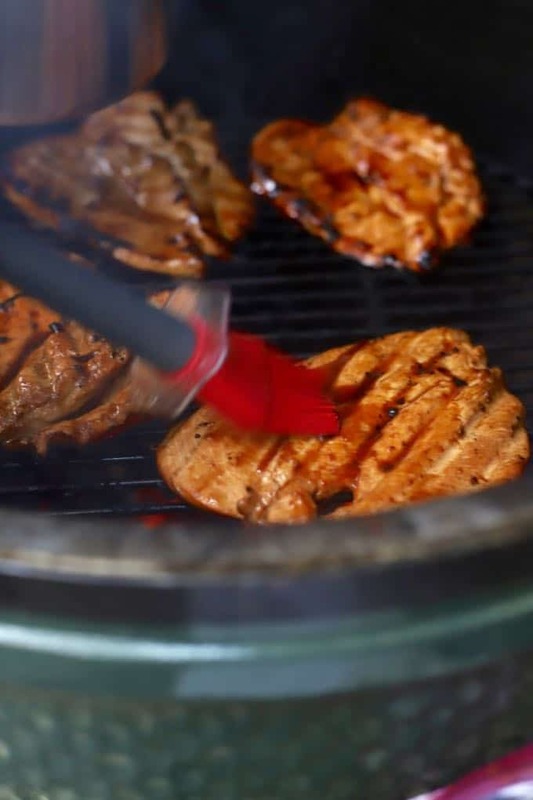 Use a meat thermometer and remove the chicken from the grill the minute it reaches 160 degrees F. It will come up to 165 degrees F while it rests. Just in time for the weekend, Grilled Teriyaki Chicken with Teriyaki Marinade is full of mind-blowing deliciousness. Arrange the chicken on the grill grates and baste liberally on both sides with the marinade. Grill the chicken for 5-6 minutes per side or until a meat thermometer registers 160 degrees F. when inserted in the thickest part of the chicken. I always make more Grilled Teriyaki Chicken than we need and freeze the leftover chicken. Then I use the leftovers to make Grilled Chicken Ceasar Salad or Grilled Teriyaki Chicken Cobb Salad. It's a MOGO of sorts, make one meal and get two or three. A win in my book! Nutrition information can vary for a recipe based on factors such as precision of measurements, brands, ingredient freshness, or the source of nutrition data. We strive to keep the information as accurate as possible but make no warranties regarding its accuracy. We encourage readers to make their calculations based on the actual ingredients used in your recipe, using your preferred nutrition calculator, especially those with dietetic allergies and food-related diagnoses.